Human Ramos cell lysate, mouse Raw cell lysate. Our Abpromise guarantee covers the use of ab13812 in the following tested applications. WB 1/500 - 1/1000. Predicted molecular weight: 46 kDa. Scaffold protein involved in the IL-1 signaling pathway via its interaction with the complex containing IRAK kinases and TRAF6. 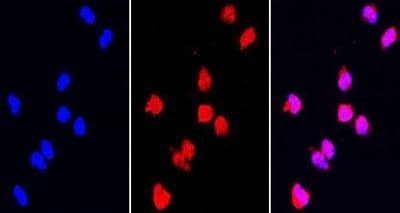 Required for NF-kappa-B activation and IL-8 gene expression in response to IL-1. Belongs to the pellino family. ab13812 staining Pellino 1 in RAW264.7 cells from Mouse macrophages by ICC/IF (Immunocytochemistry/immunofluorescence). Cells were fixed with paraformaldehyde, permeabilized with Triton 0.1% + 2% BSA in PBS and blocked with 2% BSA for 30 minutes at 24°C. Samples were incubated with primary antibody (1/100 in PBS + 2% BSA) for 16 hours at 4°C. 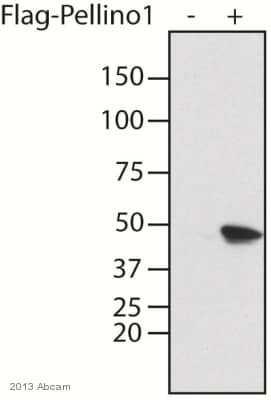 An Alexa Fluor®488-conjugated Goat anti-rabbit polyclonal(1/1000) was used as the secondary antibody..
Publishing research using ab13812? Please let us know so that we can cite the reference in this datasheet.